Hello Welcome to Questpond - An E-Learning Firm running by Microsoft Valued Professional (MVP) Mr. ShivPrasad Koirala. Mr. ShivPrasad Koirala has formed this e-learning firm for individuals who wants to learn and code Microsoft Technologies, Java, Testing and Other Open Source Technologies. Since 2001, He and his MVP Team has trained many professionals in Design Pattern, MSBI, Sharepoint, Silverlight, WPF, WCF, WWF, Azure, C#, OOPS, ASP.NET,SQL Server, Java, Testing and many more. Mr.ShivPrasad Koirala along with Sukesh Marla both MVP's along are famous for online trainings, recorded more than 1K videos and vest sellings books. Questpond are well-known oraganized in an online as well as offline training, We not only take MSBI (Microsoft Business Intelligence) training but also other technologies JAVA | MICROSOFT | OPEN SOURCE etc. You can view our 600+ videos on at our site "QUESTPONd.com". At Questpond learning not only becomes easy but it becomes more fun to learn complex things in simple way. Today, questpond are well established company in online / offline / corporate trainings. Our corporate clients are capgemini, jlt, morgan Stanley, Wipro, Tata-Consultancy etc. Here on this website you will find complete Microsoft Business Intelligence [MSBI] training program details, free msbi tutorial videos & articles along with Complete Questpond Subscription Program which covers all Microsoft related topics like MVC, AngularJS, ASP.NET, OOPS, MSBI, Testing, SQL Server and so on. MSBI course is intended for Professionals who are seeking for implementing and maintaining SQL Server reporting and analysis solutions. 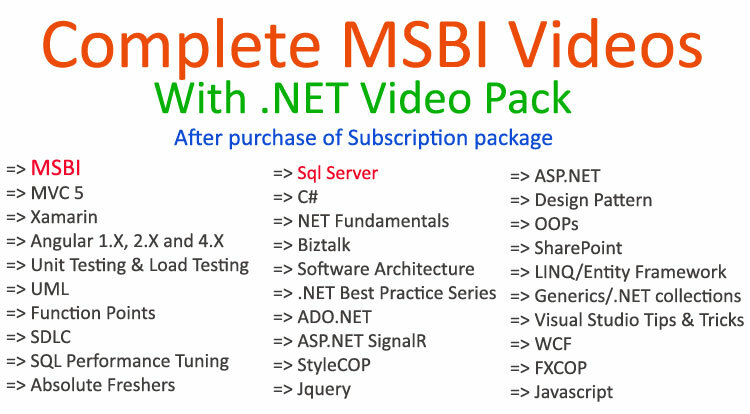 If you still have any doubt, we request you to watch our Free MSBI tutorial videos or any video from Questpond that you like.